The New Forest is a wonderful place in which to find dragonflies and damselflies. In fact, it is one of the best in Britain - of the 36 or so, British species, around 75% can be found in the New Forest; including nationally scarce insects such as the appropriately named scarce blue-tailed damselfly, and also the southern and small red damselflies. And with colours ranging from very pale blue, through red to black; transparent, delicately veined wings; and conspicuously varied behaviour; all are fascinating to watch for both casual interest and more serious study. But first, what’s the difference between a dragonfly and a damselfly? Well, for a start, dragonflies are relatively large, robust insects, whilst damselflies are more dainty creatures. Then large, compound dragonfly eyes are positioned fairly centrally on the head, and meet in the middle, whilst damselfly eyes are smaller, widely separated and positioned on the sides of the head. And finally, dragonfly wings when at rest are usually held outstretched, often at 90 degrees to the abdomen, but damselflies usually fold their wings back along the line of the abdomen. However, both dragonflies and damselflies are nowadays often referred to collectively simply as dragonflies. Typically on the wing from April until October, or maybe November in mild autumns, flight periods vary from species to species. The first of these insects to be seen is often the large red damselfly, whilst the late fliers are typically the larger dragonflies. All are cold bloodied creatures that, unlike humans, for example, cannot maintain a constant body temperature, but need reasonably warm weather to raise their temperature sufficiently for flight. Individual winged insects can live for two or three months, although for many, this phase of life is considerably shorter. In Britain’s relatively cool climate, none survive the winter as adults. Contrary to old fashioned traditions, they are harmless to humans, although in days-gone-by dragonflies were known as horse-stingers, and damselflies as devil’s darning needles. But all are ferocious predators, highly skilled hunters that survive by preying on other insects chased down in flight, killed and eaten. Many dragon and damselflies are also strongly territorial, vigorously defending their own, often quite small patch, and aggressively driving off intruders of the same and sometimes different species. In the early stages of life, all are aquatic – first as eggs, then prolarva and finally as larva, so watery habitats are typically the best places to see the greatest number of species. 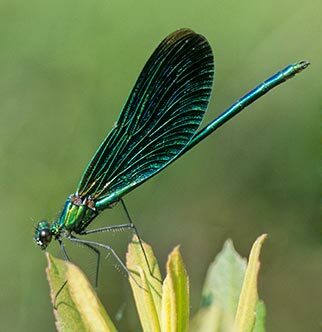 One, the aptly named, almost butterfly-like, beautiful demoiselle, is particularly associated with the fast flowing, gravel-bottomed New Forest streams, where it flies in company with kingfishers and, sad-to-say, provides a source of food for grey wagtails. Others prefer stretches of open, still water, places such as Eyeworth Pond, Cadman’s Pool and Hatchet Pond, whilst yet more - the small red damselfly is a good example - can be found primarily around the New Forest valley mires and other similar boggy areas. Pale blue male and golden-yellow female keeled skimmers are frequently encountered around heathland drainage channels, whilst a number of species habitually stray well away from water, and can often be watched patrolling woodland rides or foraging on the heaths - golden-ringed dragonflies and southern hawkers are prominent members of this group. Dragonflies and damselflies, though, are often assigned to the ‘too difficult to identify’ category of wildlife, and consequently are largely ignored. 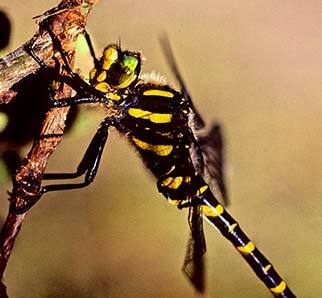 But some, in fact, can be readily recognised - look out, for example, for the distinctive golden-ringed dragonfly, the beautiful demoiselle, the closely related banded demoiselle, the large red damselfly and the broad-bodied chaser. Getting to know these provides immediate entry to the dragonfly world, at least as a partially informed observer, and by process of elimination, makes easier the task of identifying some of the more difficult species. Confident identification, though, often requires good, close views and reference to a pocket-sized field guide – A Guide to the Dragonflies of Great Britain, written and illustrated by Dan Powell, is a particularly good example.